Well, my Libby will be headed back to Boulder for her second semester on Saturday. Oh, how I loved this winter break. It truly is such a joy to see your children grow. I finished her second sock and am so grateful that she loves them so much. She pledged Delta Gamma in the fall and pink and blue are the sorority colors. I am so grateful my kids love their hand knits... and like I said, this hand knit is a dream to take care of. Machine wash and dry. Perfect for college kids! And how cute are these jeans?! We bought them at Francesca's but I think they would be fun to make. You probably just need a little bit of patience with all that fraying. Way back when the dinosaurs roamed, the DG colors were bronze, pink and blue. I don't know when bronze was jettisoned but the pink and blue socks are adorable. Libby still is a pro at modeling knitwear. You may get orders from sorority sisters after they see these. This is a great pair. I like how you have that distressed chair for photos. When I did Frankie's photo shoot, I had to try out other ideas because our chairs are too modern or new looking. 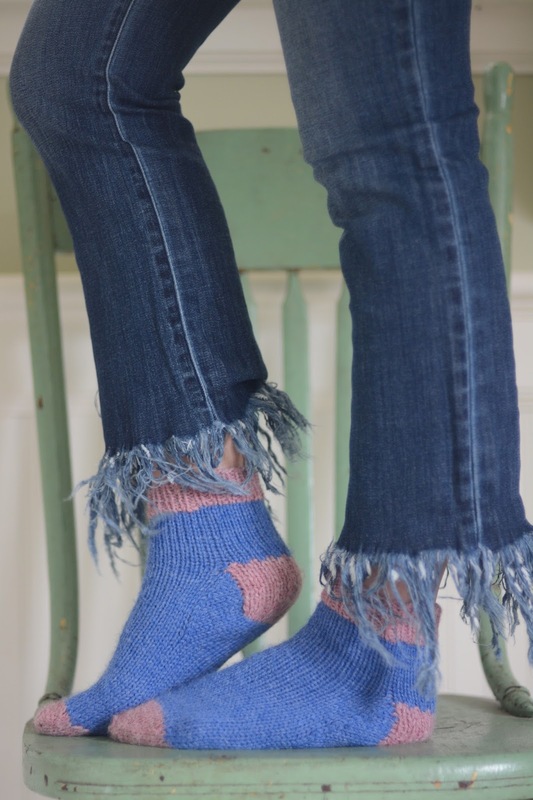 gorgeous socks, and how fun that they are in her sorority colours!Love them. PK Domain provide web hosting service in Pakistan with free domain name in. com,. net,. org,. biz. Free web hosting account and domain in Pakistan, self create your own website in no cost, get best professional hosting services for free in Pakistan. Our services are available in all cities of Pakistan you can order us via www.pkdomain.com.pk. PK Domain is providing cheapest web hosting we also offering dedicated website hosting for the first time in Lahore Pakistan.. We provide to our customers 24/7 services to our honorable customers with 99.9% up time guarantee.